The purpose of this mod is really there to fix inconsistencies that were already in the game and was released. it adds in small features to make minor improvements to the overall gameplay. Key improvements Key improvements that this mod makes our numerous. One bonemeal is enough to grow tree. Axis harvest melons faster. Breeding pigs can now be done with potatoes, apples, melons, and bread. Chickens drop feather from time to time. Another among the long list of key alterations made is that wild animals (animals found in the wild) are now actually classified as wild animals, and you have to breed them to make farm animals. Wild animals drop two thirds the amount of items. Additionally impossible to ride a wild pig, Sheer wild sheep, and milk wild cows. It takes about five generations of breeding to get farm animals. Mob dynamics of also been changed, things like baby zombies doing less damage, and animals killed by fire dropping cooked meat. Things like crafting table dynamics, and potion brewing have also been altered.YOU NEED THISYou absolutely need this mod is no reason not to have it, it does nothing but improve the gameplay you are already experiencing. It probably even fixes things you don’t like. This mod in my opinion is the patch Minecraft developers, should have released themselves. 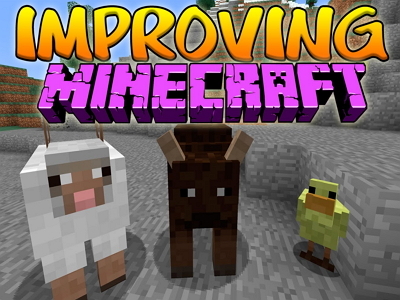 In conclusion this has got to be one of the most essential mods ever released in the history of Minecraft.